Your interior space is valuable. Whether you live in a condo, house or apartment, your floor and wall space needs to be configured to enhance your lifestyle. A custom entertainment centre is one of the best ways to use your floor space efficiently. As we tell most of our clients, using your vertical space is key. We’ve often seen ready-made units in homes that scream “it’ll do.” But a custom entertainment centre fits perfectly into your space, and, like any built-in storage system, looks like it was meant to be there. Neatening and hiding various home stereo electronics and their unsightly wiring is best achieved with a custom entertainment centre. Once some of the electronic necessities are hidden away, there is room to display your precious collectibles. A custom unit can be designed to accommodate a particular treasure, e.g. the stunning vase on the left of the photo. A feature we often add to our built-ins is an electric fireplace. As the focus of the living room or dining room, an electric fireplace can add that sense of warmth and coziness. The latest electric fireplaces also filter the air, so your allergies are kept at bay and—unlike traditional gas fireplaces—you won’t get drowsy. We use easy-to-install and easily moveable plug-in fireplaces that allow you to control the heat in a room. These units are a great alternative to gas fireplaces, which aren’t always allowed in condos and apartments. 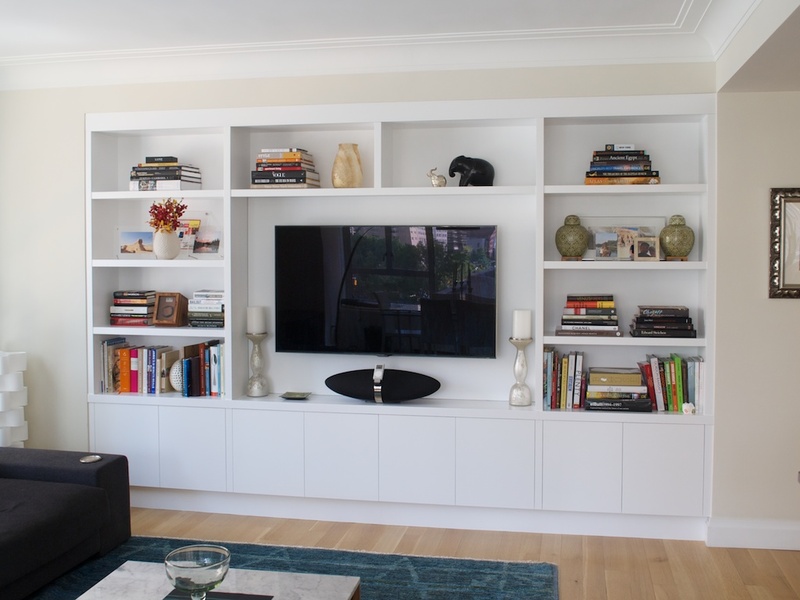 With the advent of flat screen televisions, custom entertainment centres have become the perfect way to organize your electronics in one space while hiding them from view. Lighting is also important, not only because it illuminates any collectibles you want to display but also because it directs your eyes to the focal point of the room. Nowadays, LEDs are the optimal lighting solution. When you’re ready to enhance your home with a custom home entertainment centre, contact Space Age Closets.